Have you tried placing it in the volume's resources(in the iHub encyclopedia) folder instead of on the file system? Yeah, I think I know what you are referring to and I've tried to add it there as well, still the same. I'm compiling in java 1.7, is that the proper version for ihub? Yes, that java should be fine. Are you on an AJC, or a full iHub visualization? If you aren't on an AJC, then I don't believe that's the right location. We have full iHub visualization. In that case, that wasn't the area I was looking for. You want to place it in the volume, not the file system. Navigate to hostname:8700/iportal and login. 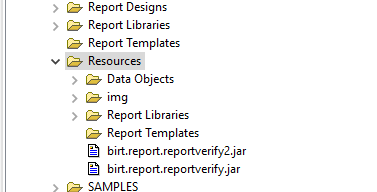 Try placing the jar file in the resources folder there, in the iportal. Unfortunately that didn't work for me either.